While I said I was done with the food entries from Maui, there actually is one dessert/snack entry remaining: Ululani’s Hawaiian Shave Ice. Andy’s wife Sugi (I can say “wife” now – yay!) enjoying her favorite shave ice. Since her mother is from Maui and Sugi spent her summers growing up on the island, I put great stock in her number-one rating for Ululani’s. After some so-so experiences with shave ice on Kauai last year, I was surprised at how good the dessert can be – if you go to the right place. 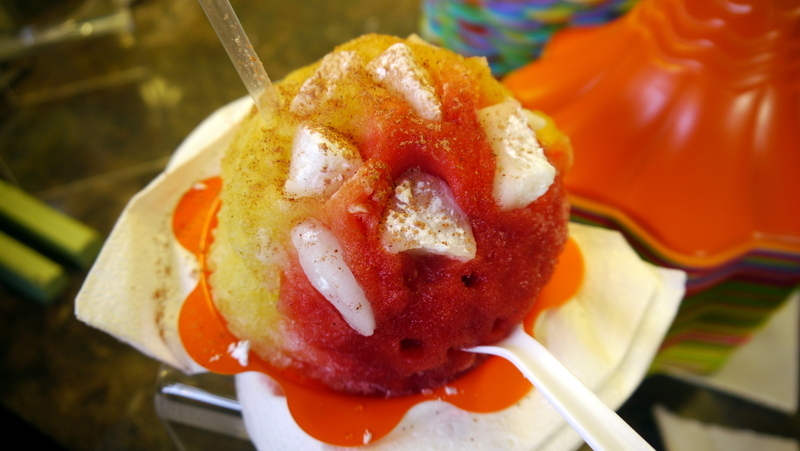 Shave ice, often confused by mainlanders with snow cones, is a local Hawaiian specialty. Unlike snow cones, which are made with crushed ice, shave ice is precisely that – shaved – with a texture akin to snow. (I know, it would seem that shave ice should really be called “snow cones,” right?) This is important because while a snow cone results in a big pool of flavored syrup sitting at the bottom of a cup of ice, shave ice absorbs the syrup, ensuring that each bite is full of goodness. Ululani’s has four locations on Maui – two near each other in Lahaina, one in the island’s main town of Kahului, and the newest shop on the north side of Kihei. We went to the original location on Front Street in old town Lahaina. Each of Ululani’s 40 flavored syrups is made in-house using fruit purees, extracts, filtered water, and pure cane sugar. Toppings are either home made or come from other Maui companies. This local approach is one of their secrets to success. Now, it is true that shave ice can be a sickeningly sweet dessert. The key is to choose favors that create complexity and contrast rather than just add one layer of sweetness on top of another. 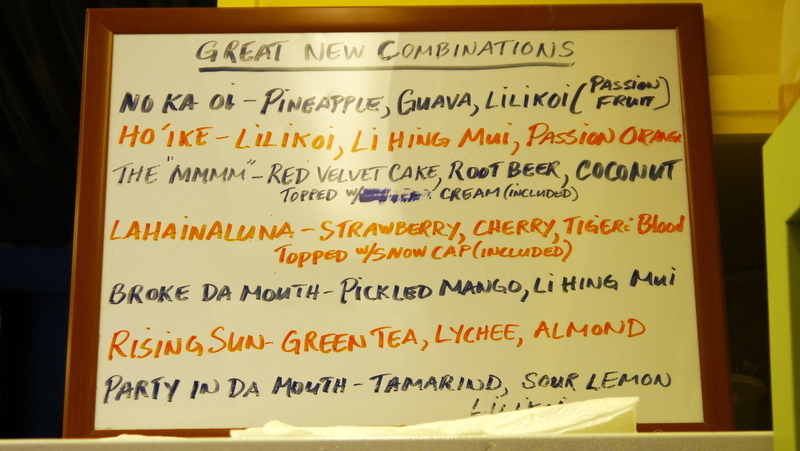 I chose a recommended combination – Ho’ike – which offers lilikoi (passionfruit), li hing mui (Chinese salted plum), and passion orange. 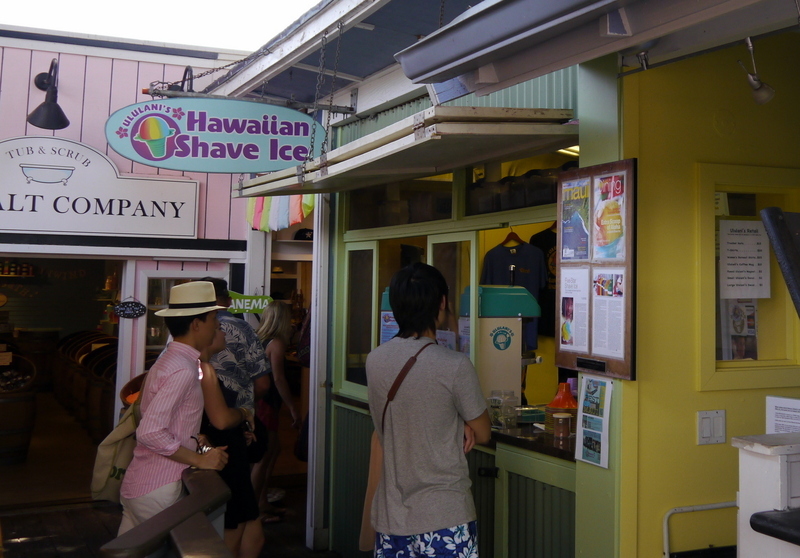 The salted plum adds a tart and salty note that cuts the sweetness, making the shave ice refreshing. Another part of Ululani’s charm is their friendly employees. Sure, I’m a mainlander who barely knows my pu pu platter from my poke. 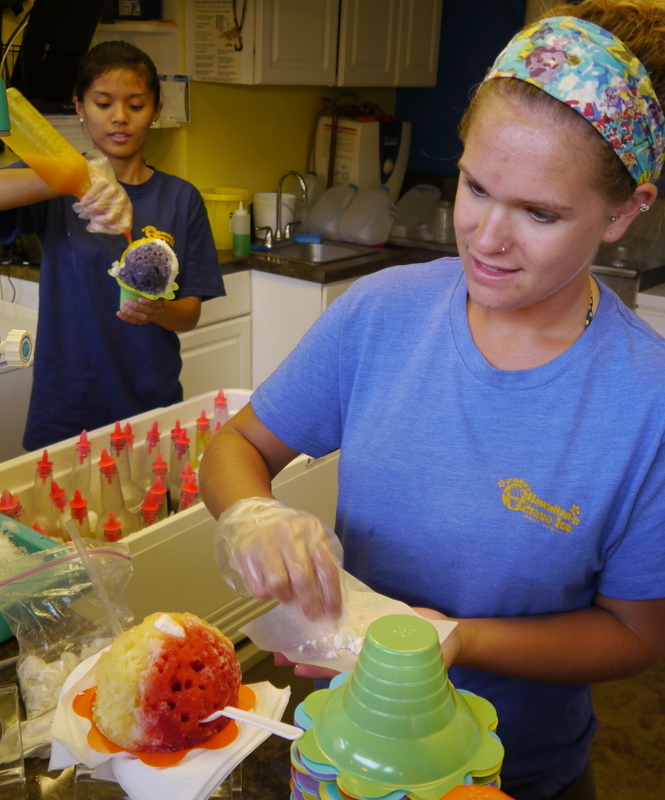 But this young lady was patient, happy to answer every question with a smile, and chatted with us about our visit to Maui while preparing our shave ice. In this picture, she adds mochi (made by Maui Specialty Chocolates) to my shave ice. This entry was posted in Uncategorized and tagged dessert, Dining, food, Hawaii, ice, Lahaina, Maui, Restaurant, shave, shaveice, snack, Ululani by christao408. Bookmark the permalink. Hot Dang! That is just too cool Chris. OMG. I want it so much! I’m drooling! 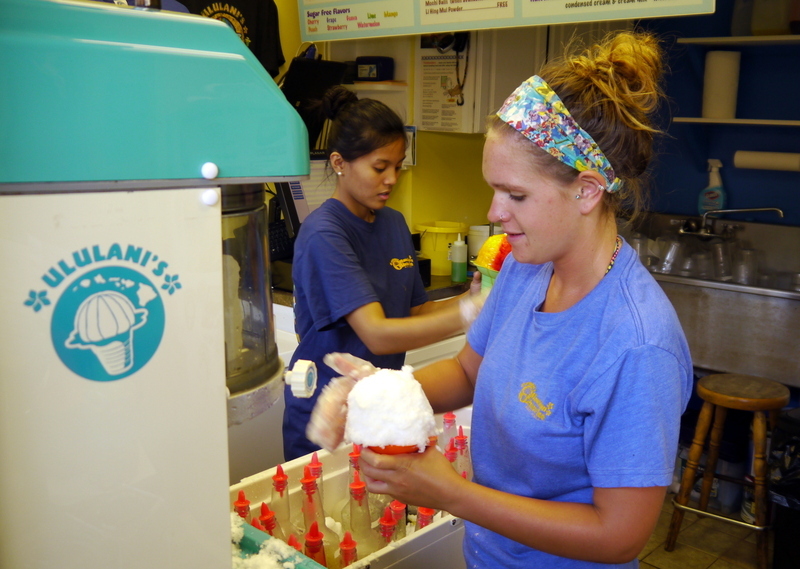 I love the shave ice (when it can be found) at the fair… but their flavors are very very limited. I like the pineapple. I’m a purist… but then again I’ve never had the selection available there!!! Now that is a desert!!! Did you add ice cream inside your shaved ice? That’ll be really an icing on the cake! If I lived near Ululani’s, I’d probably have a cone every day. No Hawaiian ocean breezes here. @awoolham – Thanks for the recommendation! @paperblanks – It would probably do well in Canada for about two months each year. @Inciteful – Wish we could send some Hawaiian breezes your way. It’s actually cooler right now in Bangkok than in much of the US. @CurryPuffy – Of course ice cream! Macadamia nut – one scoop on the bottom. @Fatcat723 – @amygwen – @ZSA_MD – It sure is. @iskrak – Maybe made in-house with artificial flavors? Ha ha… sorry, cynic in me. I’m sure most of them are made with at least some amount of actual fruit. @murisopsis – The nice thing about mixing flavors is that you get more contrast. But I can understand the purist’s point of view. @Devilzgaysianboi – I’ll send you some. I’ve had something like this but it was more like crushed ice. This looks a lot better! 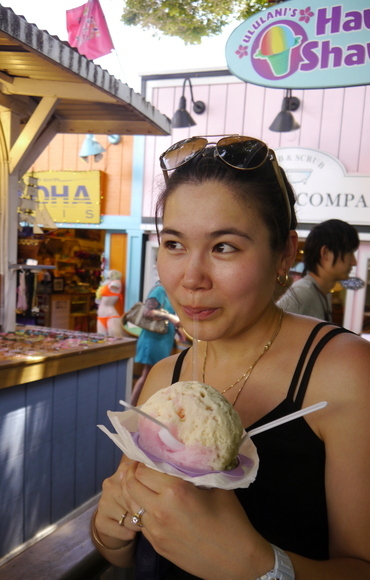 @ElusiveWords – Yeah, shave ice is really pleasant. Crushed ice snow cones? They’re for the birds. i don’t know how i missed this post. but i did. and glad to have came across it now. YUM.